(17/P58) TRENTON – Thousands of volunteers, many of them students, are joining Department of Environmental Protection Commissioner Bob Martin and department staff today for the eighth Barnegat Bay Blitz, a watershed-wide cleanup that draws attention to stewardship of the ecologically fragile bay. This event allows residents to directly participate in Governor Christie’s comprehensive restoration plan for the bay and enhances public awareness of this natural resource. The bay’s 660-square-mile watershed spans all or parts of 37 municipalities in Ocean and Monmouth counties. A study by the University of Delaware for the nonprofit Barnegat Bay Partnership estimates that the watershed and activities related to its natural resources contribute more than $4 billion to the state’s economy each year and directly or indirectly support more than 60,000 jobs. The first Barnegat Bay Blitz was held in October 2011. It has grown significantly over the years. 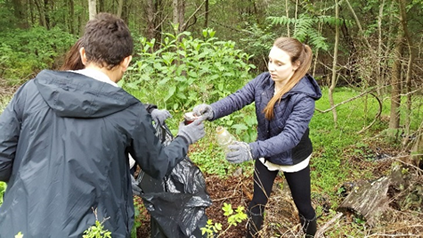 To date, more than 27,000 participants have removed nearly 4,200 cubic yards of trash and recyclables from the watershed. 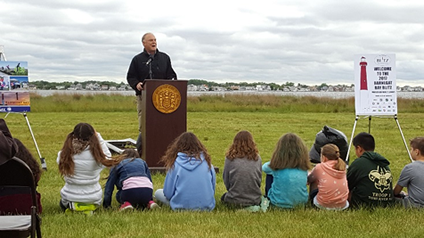 Following ceremonies at the Ocean County Parks and Recreation offices in Toms River, teams fanned out throughout the watershed to clean up wetlands, stream banks, stormwater discharge points, schools, trails, docks, areas around bulkheads and the waters of the bay itself. Each team is led by a captain, typically a DEP employee. Long, shallow and narrow, Barnegat Bay is susceptible to the impacts of stormwater runoff and accumulations of trash and debris along its shorelines and in its wetlands. Removal of trash is important to prevent these materials degrading the bay’s ecological and scenic values. Stormwater carries other pollutants such as common lawn fertilizers, automotive fluids and silt that degrade wildlife habitat and water quality in the bay and its tributaries. Trash collected today is being turned over to local public works departments for proper disposal. A commitment by Exelon Corp. to decommission the Oyster Creek nuclear reactor in Lacey Township by the end of 2019. Blitz sponsors include New Jersey Clean Communities, the New Jersey Environmental Infrastructure Trust, the Barnegat Bay Partnership, Wawa, Waste Management, TowBoat US, the U.S. Geological Survey, New Jersey Natural Gas, Ocean Spray, Suez-United Water, Ocean County government, PS&S, Firestone, the Conserve Wildlife Foundation of New Jersey, ReClam the Bay, Save Barnegat Bay, AmeriCorps Watershed Ambassadors, Boating Education and Rescue, and the U.S. Coast Guard.